This is the chart that people have been wanting to see in print for years! 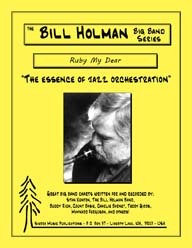 Recorded by the Bill Holman Band on their album "Briliant Corners", this is the great Thelonious Monk tune set in a straight-eighth Latin feel. The new CD Brilliant Corners, as recorded by Bill Holman's Band, is taking the jazz world by storm! Here is one of the ballads on the recording, which contains all Thelonious Monk compositions as arranged by Holman.